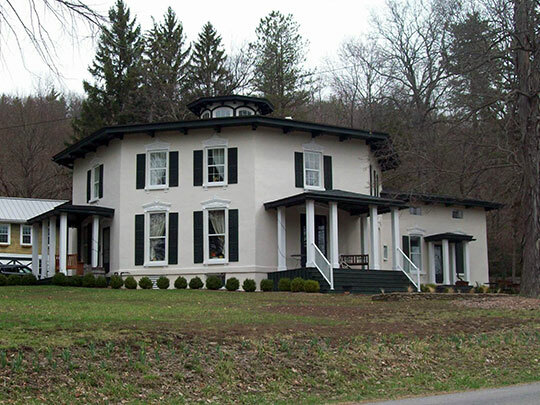 Urbana Town Hall is located at 41 West Lake Road, Hammondsport, NY 14840; phone: 607-569-2708. Photo: Timothy M. Younglove Octagon House, ca. 1859, 8329 Pleasant Valley Road, Urbana, NY. Listed on the National Register of Historic Places in 2002. Photographed by User:	Pubdog (own work), 2011, [cc-by-1.0 (creativecommons.org/publicdomain/zero/1.0/deed.en)], via Wikimedia Commons, accessed August, 2013. In the spring of the year 1793, William and Thomas Aulls left their former home in Lancaster, PA, determined to establish for themselves and their family a permanent abode in the new yet widely known Genesee County. They visited Geneva and Bath, both of which were primitive settlements, and finally made their way toward the head of the famed Lake Keuka. This journey naturally led the travelers into the beautiful Pleasant Valley country where they found lands suited to their wishes. This was the first civilized settlement within the present town of Urbana, although the country had been frequently traversed between Bath and other southern settlements, and Geneva and Canandaigua. Through the valley was the principal Indian trail leading to the head of the lake and thence down the same on both east and west sides. After clearing and planting sufficient for the necessities of his family during the coming winter, the senior Aulls returned to Pennsylvania and brought other members of his household to their new home. In the fall of that same year (1793), Samuel Baker also built a cabin and made an improvement in the locality, and in the spring of the following year, brought his family to the valley, accompanied or closely followed by Richard Daniels and Amos Stone. William Read came about the same time and has been mentioned as the third settler of the town. On April 17, 1822 the Town of Urbana was set off from Bath and given a separate organization. In 1839 a part was re-annexed to Bath, while in the same year a portion of Wheeler was annexed to Urbana; also a small part from Pulteney on April 12, 1848. In 1890 Urbana had a population of 2,590 inhabitants. Honorable Harlo Hakes, editor, with L. C. Aldrich and others, Landmarks of Steuben County New York, D. Mason & Co., publishers, 1896.